Wolf wants cinema to be a dream machine that creates unforgettable memories and encounters – real and fictional. Our two bespoke screening rooms were created in close collaboration with filmmakers to ensure that we provide image, sound and acoustic quality that does justice to the hard work of making a film. Every Tuesday at 10:30 am Baby Wolfgang screens films for parents and their babies - Breastfeeding and sleeping is welcomed! During the screening we keep the volume low and have dimmed lighting, so that your babies feel comfortable and if there’s a baby that feels like shouting or crying during the film the other parents certainly understands, so no stress needed. We offer space to park the prams as well as a changing table, and after the screening there’s the opportunity to treat yourself to a drink and lunch in our beautiful café. Every week we show a new film, always with subtitles (mostly in German but now and then with English subtitles), so that parents can follow the film regardless of a baby choir that decided to scream and sing. Wolf’s bar and café opens at 10am (weekends at noon) and closes late in the evening. It is a place to meet - with or without watching a film. We hope this space will be the home for many inspiring, drunken, sober, silly, earnest and unforgettable encounters. The bar is fully licensed, the coffee machine chews on fine, carefully chosen espresso beans and weekdays from 12 to 4pm our cook Machiko makes great lunches. The Studio is under the same roof as the cinema but with a separate entrance on street level. It is the left brain of Wolf, where the boundaries of the traditional cinema screen are challenged. 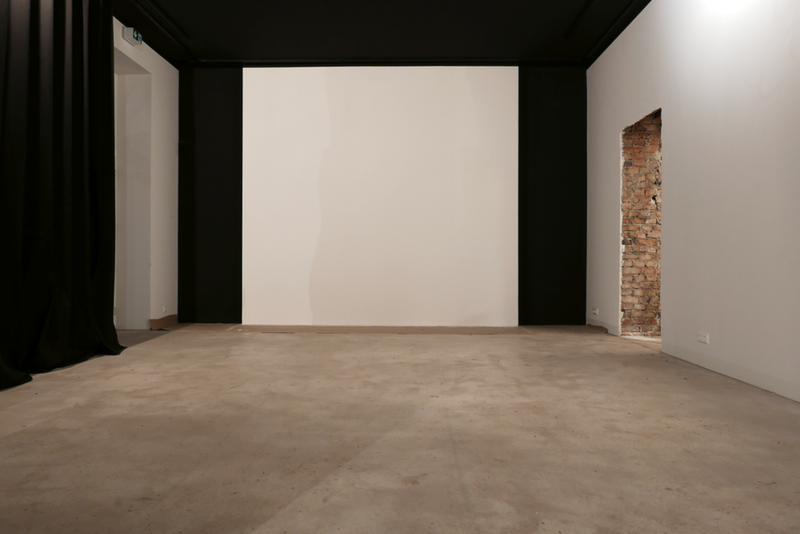 The Studio room is a versatile and convertible screening-, exhibition- or event space and its programme is concerned with all aspects of the moving image: be it analogue or digital, virtual or hyperreal. Its multi-functionality accommodates exhibitions, installations and live-performances. Wolf also offers regular workshops and discussions creating a space where film education, training and practice merge – where those curious about film and those who are experts meet and exchange. 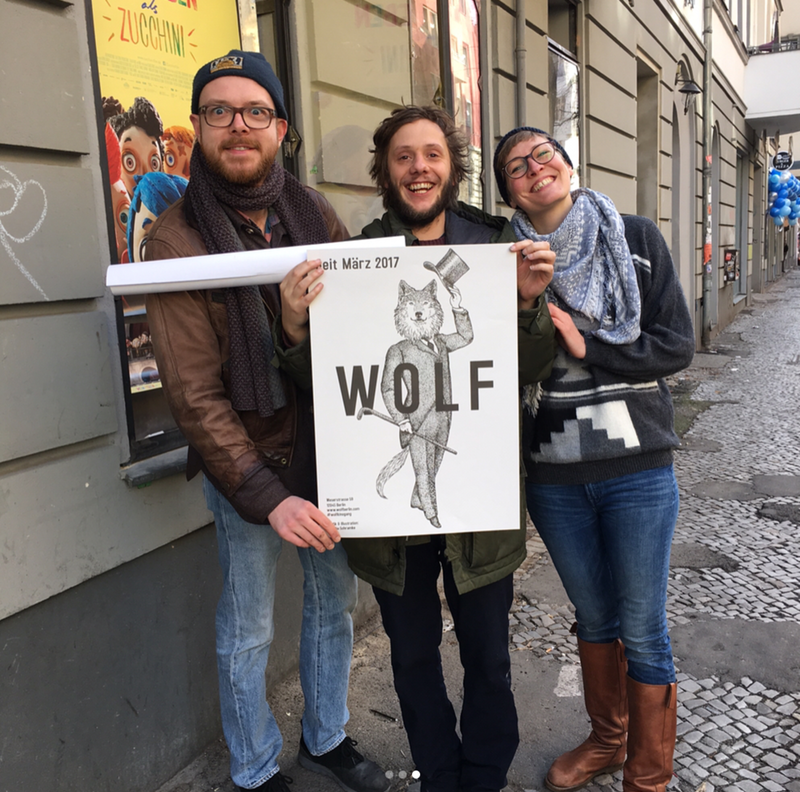 Now and then, Wolf also acts as a distributor and releases films – to our own and other cinemas – that don’t get regular distribution in Germany. These are films that we especially love, festival highlights and discoveries, works of directors that we feel especially close to and for which we want to generate enthusiasm beyond Wolf’s audience. PLANEMO is a post-production studio offering colour grading, mastering, transcoding and visual effects for cinema, TV, web and exhibition. Although the studio was officially established in mid 2018, it existed long before in the minds of its founders and had the dedicated space and attention already during the creation of Wolf cinema back in 2016. Founded by filmmakers, film directors and film producers, ''Planemo'' is a place where post-production is lived and shared with love. Apart from various post-production works, PLANEMO studio can be also rent out for a certain period of time. Contact PLANEMO for additional information on post-production set-up and prices at contact@planemofilm.com . Alex Thiele, Hajo Schäfer, Katja Adomeit, Dagmar Jacobsen, Bernhard Karl, Arvid Wölfel, Conny Lohmann, Catherine Ricoul, Jack Howard, Jonathan Howell, Britt Dunse, tony jones, Steffen Gerlach, Stephan Wagner, F. J. Passamonte, Franzis Walther, Alexander Wadouh, Noel Qualter, Milena Fessmann, Leila Zanzibar, Katharina Bellena, Ludmila Cvikova, Frédéric Jaeger, Beth Sanders, Chrischa Oswald, Jakob Huefner, Sebastian Böhm, Fabian Gasmia, Henning Kamm, Thomas Lovegrove, Ursula Reber, Dominic Fitzgerald, Monika Kijas, Nawid Sarem, f.u.c. Film, Dickon Bevan, Sandro Fiorin, Michael Maggiore, Stefan Oliveira-Pita, Christoph Gröner, Magda Wystub, Irene von Alberti, J.-C. Simon, Matthias Luthardt, Anke Hentschel, Paul Andexel, Madeleine Girke, Stefan Adrian, R. Golembiewski, K. Stavrianou, yannis trouinard, Ruth Maiazza, Hoggard Wagner, Maria Drandaki, Yorgos Tsourgiannis, Laura Heberton, Kris SP, Alexander Stein, Johanna Domke, Jon Sanders, Ann C. Renninger, Ashley Horner, Toby Cornish, Anke Petersen, Kate Chamuris, Katya Sander, Sean Jourdan, Carla B. Guttmann, Adrien Aumont, Jan Grygoriew, Christine Kolbe, Birgit Kniep-Gentis, D.-M. De la Vega, Iana Stefanova, Jakob Lass, Martin Heisler, Felix von Boehm, Jason Kohl, rebekkan garrido, Marita Neher, Marga Boehle, Marcin Malaszczak, Maria Rogel, Hannes Rössler, Sebastian Gutierrez, M. Blankemeyer, Mathilde Benignus, Imogen Heath, Catalina Rojas, Jamila Wenske, Hermann Horn, Claudia Steffen, Paola Barreto, Sn Cleemann, Maike Höhne, Frank Klaffs, Claudio Pfeifer, M.&V. Baumgartner, Jochen Jezussek, Sophie Funke, Jan Krüger, Judith Holzer, Connie Walther, René Fietzek, Benny Drechsel, Eva Stotz, Stephanie Riess, Martin Danisch, F. Koerner v. Gustorf, Uli M. Schueppel, Fabian Altenried, Sophie Kluge, Franz Rodenkirchen, Jochen Laube, Lieke Anne, Felix Stienz, Federico Spoletti, Alan Bishop, Sabine Steyer, Suse Marquardt, Michael Hehl, Adrian Baumeister, Fully Flared-Films, Philip Schramke, Bernd Fraunholz, Nakako Takei, Titus Kreyenberg, Aurelie Moigno, Julia Harries, Lopes Priscila, Edvinas Pukšta, Rita K. Konrad, Z. Kerschberg, WOLF Consultants, Wolfgang Wimmer, Joachim Kurz, Vanessa Temps, Khalid Abdalla, Michael Brent Adam, Mark Adams, Nils Aguilar, Abdul ilah Albayaty, Hana Albayaty, Leila Albayaty, Bastian Albers, Vik Aleksandrovich, Lobna Allamii, Eva Therese, Alshut, Michael Amberg, Ulf Aminde, Jona Armborst, Nike Arnold, Michael Arnon, Thomas Arslan, Sam Ashby, Toby Ashraf, Emily Atef, Ute Aurand, Sophie Auriault, Melanie Autenrieth, Solmaz Azizi, Gaby Babic, Anabel Bach, Katinka Bach, Michel Balagué, Boris Balin, Magda- lena Banasik, Axel Bangert, Tom Bartels, Jule Bartram, Elisabeth Baulitz, Clara Bausch, Peter Bausch, Guillaume Bazan, Julia Becker, Maximilian Becker, Sven Becker, Dennis Beckmann, Christine Beilharz, Jotinka Bell, Johanna Bentz, Edward Berger, Max Berger, Johannes Bergill, Laura Bierling, Lars Bilharz, Niklas Binder, Vincent Biot, Pivi Black, Larissa Blau, Martina Bleis, Frances Bodomo, Manfred Bogner, Konstantin Bojanov, Aline Bonvin, Aisha Borkowsky, Luca Jacob Borkowsky, Alessandro Bortolazzo, Georg Bosch, Lorna Bösel, Barbara Bossuet, Silke Botsch, Julien Bouille, Nick Bradshaw, Anke Brandt, Verena Brandt, Ulrich Braun, Eva Breitbach, Lars Breuer, Sophie Brown, Hannes Brühwiler, Andrew Bujalski, Georg Bütler, Daniel Calladine, Barney Calman, Michelle Carey, Ilaria Celestini, Bryn Chainey, Samia Chancrin, Laura Christine, Elly Clarke, Johannes Conrad, Katharina Copony, AC Coppens, Laura Coppens, Marta Cortés, Mario Santos, Emiliano Santos, Matias Santos, Melanie Crawley, Davide Crivelli, Joseph Curran, Michael Dahm, Robert Damrau, Jörg Daniel, halina daugird, Ana David, Cathy de Haan, Eude de Montgolfier, Helen de Witt, Josephine Decker, Noaz Deshe, Michel Diercks, Armin Dierolf, Laurin Dietrich, Stefanie Dilger, Viktor Dill, Paul-Jasper Dittrich, Benny Drechsel, Lea Dror-Batalion, Willem Droste, Anne Düe, Michaela Düll, Melissa Dullius, Marylise Dumont, Gareth Eagles, Ann Edwards, Dagmar Ege, Susa Ehlers, Peter Eiff, Tamer El Said, Frieda Erhart, Ralph Eue, Gareth Evans, Gritta Ewald, Lukas Feigelfeld, Anja Feilke, Lori Felker, Ailsa Ferrier, Alex Finkle, Pierre-Emmanuel Finzi, Marcus Fjellström, Fiona Fletcher, Philip Foxwood, Otto Franke, Harald Friedrichs, Janosch Friedrichs, Anita Fritz, Christian Frosch, Charlene Fuchs, Kat Fürnkranz, Loreta Gandolfi, Murielle Gandre, Bärbel García Salpeter, Isa Ge, Lorenzo Gentili, Antje Gerber, Charles Gertmenian, Christian Glaeser, Mun Go, Veronika Go, Emma Gräf, Barbara Granato, Carmen Gray, Ingo Grell, Danny Gronmaier, Simon Groß, Bastian Günther, Katharina Günther, Peter Gunzenhauser, Lisa Gutermuth, Philipp Haberlandt, Dominique Haensell, Esther Hafner, Martin Hagemann, Thomas Hailer, Basim Hajar, Schäfer Hajo, Mahelia Hannemann, Christian Hansson, Helena Hansson, Saga Hansson, Oli Harbottle, Aaron Harding, Anna Sofie Hartmann, Jana Hartmann, Nicole Hartmann, Frances Harvey, Tina Haseney, Frank Hauschildt, Isabelle Heereman, Lorenz Hegel, Patrick Heidmann, Hans Christian Heinemeyer, Thilo Heinzmann, Frank Heise, Igor Heitzmann, Sophie Heldman, Juliette Hell, Thomas Helm, Anna Henckel-Donnersmarck, Vera Herchenbach, Janina Herhoffer, jasmin herkel, Verena Herz, Katharina Hiersemenzel, Simon Hillmann, Maren Hobein, Anna Hoffmann, Lena Hoffmann, Simon Hofmann, Majella Horan, Friederike Horstmann, Rene Horvath, Daniel Hübschmann, David Hudson, Kelly Hughes, Anita Iniessoh, Elhum Irani, Laura Izuzquiza, Simon Jablonski, Gesa Jäger, Maria Jahn, Veronika Janatkova, Sigrid DPA Jensen, Jimmeh Jimmeh, Fabian Joas, Gierlinger Johannes, Louise Johansen, Lisa John, Laura Jung, Sandra Jung, Lena Kammermeier, Steve Kantor, Anna Katchko, Hanna Keller, Sarah Kempin, Nzingha Kendall, Anthea Kennedy, Marietta Kesting, Christof Kiefer, Annette Kilzer, Zsuzsanna Kiràly, Caroline Kirberg, Rainer Kirberg, Tom Kirk, Tatjana Klapp, Carmen Klaucke, Sophie Klebba, Dagny Kleber, Till Kleinert, Anna Kliemann, Marie Kloos, Jan Klöthe, Lea Kneist, Eva und Jürgen Knodel, Matthijs Wouter Knol, Familie Knoop, Ekkehard Knörer, Harriet Knowles, Kristine Knudsen, Tess Knuth, Axel Koenzen, Lill-Ann Koerber, Kathrin Kohlstedde, Steffen Köhn, Andreas Köhnemann, Bessel Kok, Ivana Kollarova, Thomas König, Bastiaan Korner, Simon Köslich, Kuba Kosma, Beate Kosubek, Michael Kotschi, Michael Kotschi, Joji Koyama, Nora Krahl, Nina Kraus, Britta Krause, Katrin Kreinsen, Viviane Kriebisch, David Krippendorff, Almuth Kuchenbäcker, Katja Kuhlmann, Gesine Kusine, Lysette Laffin, Ramon Lamarca, Bernd Lange, Fabian Langer, Anna Laura, Lise Lautenbacher, Katja Lautenschläger, Bill Lawrence, Kristin Lawrenz, Paz Lazaro, Toby Lee, Amelie Legrand, Silke Lehmann, Sebastián Lelio, Joanna Lemonnier, Kai Lentrodt, Cyril Lepagnot, Anke Leweke, Christiane Lilge, Ivette Löcker, Julia London, Lena Loose, Sharmaine Lovegrove, Emily Lundin, Silvia Lupia, Elena Lustig, Franz Lustig, Sebastian Luther, Mirko Lux, Alexander Maasry, Laura Maasry, James Mackay, Marcin Malaszczak, George Manatos, Pia Marais, Gandre Marithe, Martin Martin, Thomas Martin, Anna Martini, Niklas Marzinek, Carlo Märzke, Gesa Massur, Benoit Maubrey, Maximilian Mayrshofer, Kate McNaughton, Isabelle McNeill, Stefan Mehren, Caroline Meinke, Henrike Meyer, Kira Meyer, Stütz Michael, Toby Miller, Anne Misselwitz, Petar Mitric, Christian Modersbach, Nora Molitor, Birgit Möller, Marlène Monteiro, Judith Morisseau, Hannah Mowat, Kumar Muniandy, Jasel Nandha, Valeska Neu, Stefan Neuberger, Gerrit Neuhaus, Nana Neul, Alexander Nowak, Andreas Oberschelp, Freddy Olsson, Chris Oosterom, Agnes Orosz, Kyle Ott, Logan Ouellette, Lia Pack, Jana Pape, Milena Pastreich, Hannah Patterson, Andreas Pauli, Lydia Penke, Jan Peters, Stefan Pethke, Karin Petrovszky, Emma Pettit, Eliaz Peuvedic, C. Pfenninger, Anna Pfitzenmaier, Raymond Phathanavirangoon, Ruth Pickard, Steph Pierzchala, Caroline Pitzen, Sascha Pohflepp, Jutta Pohlmann, Fritz Polzer, Martina Priessner, Yvonne R., Julian Rabus, Folke Racho, Karolina Raczynski, Julian Radlmaier, Samira Radsi, Lola Randl, Jack Rath, Berthold Rebhandl, Maryanne Redpath, Phlip Rei, Lena Reinhold, Irene Revell, Stephan Richter, Nadja Riegler, Christina Riesenweber, Tose Riesser, Juliette Rigalleau, Jessica Rinland, Selina Robertson, Nick Roddick, Nigel Rogers, Jonas Römmig, Lucy Rosenstiel, Katharina Rost, Charles Rubinstein, Lars Rudolph, Sagago Rumpa, Werner Ruzicka, Mia S., Jonas Saabel, Alexander Sailer, Agnès Salson, Maia Santos, Carlo Sapp, Nawid Sarem, Julie Savary, Sarah Schill, Pascale Schiller, Sebastian Schiller, Angelika Schindler, Nadine Schindler, Wogu S., Mareike Schmale, Julia Schmid-Neuhaus, Laura Schmidt, Ursula Schmidt, Anna Schneider, Christiane Schneider, Morten Schneider, Silvie Schneider, Kathrin Schoemer, Frank Scholz, Hannah Schopf, Catharina Schreckenberg, Carmen Schreier, Lisa Schwabe, Emma Scott, James Scullin, Jana Seehusen, Sebastian Selig, Vroni Senil, Camille Serre, Russell Sheaffer, Mark Shlomchik, Susann Siebert, Linda Söffker, Steffi Spachmann, Damian Spandley, Wieland Speck, Jan Speckenbach, Michael Spiegel, Gordon Spragg, Ole Sroka, Stefan Stabenow, Petra Stangenberg, Nicole Stecker, Tina Steffan, William Stewart, Sarah Strandt, Stephanie Stremler, Tom Streuber, Marion Strohschein, Wolfgang Stuppert, Angelika Stute, kristin Suckow, Johannes Suhm, Nat Tafelmacher-Magnat, Chloé Tailhandier, Hess Taylor, Lorna Tee, Maja Tennstedt, Christoph Terhechte, Johanna Terhechte, Andre Terwei, Jonas Thaysen, Agathe Theodore, Marc Thiebaut, Hugh Thorn, Alissa Timoshkina, Laure Tinette, Nadja Tobias, Cecile Tollu-Polonowski, Laura Tonke, Jack Toye, Monika Treut, Tina Tripp, Feli Tsibanouli, Abdul Twebti, Syllas Tzoumerkas, Fokko Ukena, Sonja Umstätter, Annabelle Vassallo, Livia Verstegen, Moise Victor, Lilo Viehweg, Flore Vigneron, Anette Violet, Luise Voerkel, Jörg Volkmar, Petra Volpe, Max von Aderkas, Britta von Gehlen, Augustinus von loe, Jan-Erik Jakki Von Lühmann, Francoise von Roy, Carl von Siemens, Gotthardt von Stackelberg, Lilly von Stackelberg, Magnus von Stackelberg, Sabine von Stackelberg, Titti von Stackelberg, Tonia von Stackelberg, Illo von Stackelberg, Mathilde Vrech, Jons Vukorep, Torsten Wacker, Bernhard & Margaret Wagner, Brigitta Wagner, Christian Wagner, Stephan Wagner, Isabel Waidner, Maria Walser, Sylvia Wandtke, Jeremy Wang-Iverson, Natalie Warlow, Marco Wedel, Marlies Weerts, laurence Wegener, Florian Weghorn, Tobias Weise, Lars Weitemeier, Gudrun Westphal, Allison Whitney, Ian Wiblin, Philip Widmann, Marvin Wiechert, Frauke Wiegand, Susanne Wienemann, Henning Wiethaus, Elvia Wilk, Claudio Winter, Richard Winter, Hannah Wolf, Gerrit Woltemath, Jason Wood, Kristofer Woods, Mark Woods, Katharina Wörner, Ugur Yildirim, Jo Zahn, Julieta Zarankin, Ulrich Ziemons, Ulrike Zinke, Pola Zobel, Laura Zrenner, Lina Zuppke, Iavor Zvetanov. 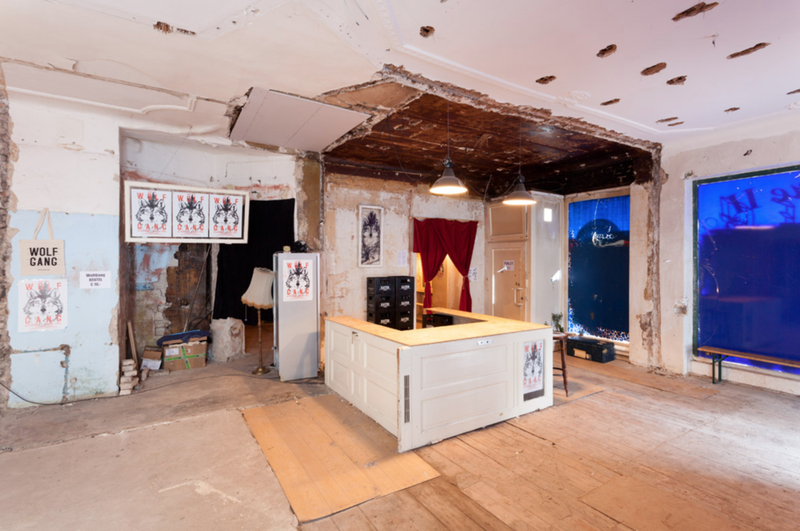 A lot has happened from the 20th of December 2011, the date when Verena first stepped into the building that would eventually become Wolf, to what will be our official opening on the 25th February, that has taken what was once a disused and crumbling space and turned it into a cinema. Those years have been filled with an unimaginable energy and continued commitment from an innumerable amount of people whose combined efforts have finally pushed Wolf into existence. The success of the crowdfunding campaign, which ran from the beginning of February until the end of April 2015, still feels surprising, even with two years of reflection. The enthusiasm that it attracted, both locally and internationally, was very welcome but certainly unexpected. I think for all of us it was the spark that allowed building to begin with absolute focus, giving us the feeling that our heartfelt but, up until that point, untested belief that cinema could be done differently, would have sense of home and of purpose. It showed us conclusively that people were excited and hungry for an alternative way of cinema going. The building work began in August 2015 and required a complete overhaul of the interior. 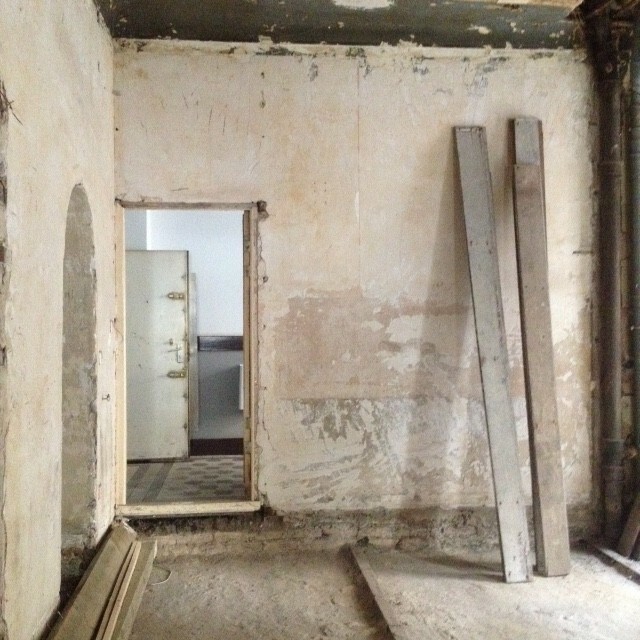 For anyone who visited us during the two month period of our crowdfunding campaign, I’m sure you noticed the building’s state of disrepair that, although we still have a fondness for, was not suitable to our needs in any way. Holes in the ceiling, uneven wooden floors, and walls better suited as windows may have had a certain charm but unfortunately don’t make for a fully operational cinema. The fact that we are also located in a residential area meant that noise was a huge factor and led to the necessity of sound proofing our screens and cafe area. Reminders of the building’s previous occupants were everywhere before work began. From the blacked out windows, to the garishly painted pink walls and, as we discovered after beginning to build, an industrial oven used by the bakery, the first of many hurdles that required the help and effort of many people to remove. Once the oven was gone and the old floor boards came up we discovered, set within the concrete floors, the footprints of one of the previous inhabitants. One of the builders told us that he estimates they are about 100 years old. I’m sure you can imagine the tasks that followed. Electrical work, pulling down walls and then putting up new ones, amongst many other things, all completed by a team of invaluable professionals, and, on the other side, painting, cleaning, etc all completed by a host of enthusiastic volunteers and collaborators. 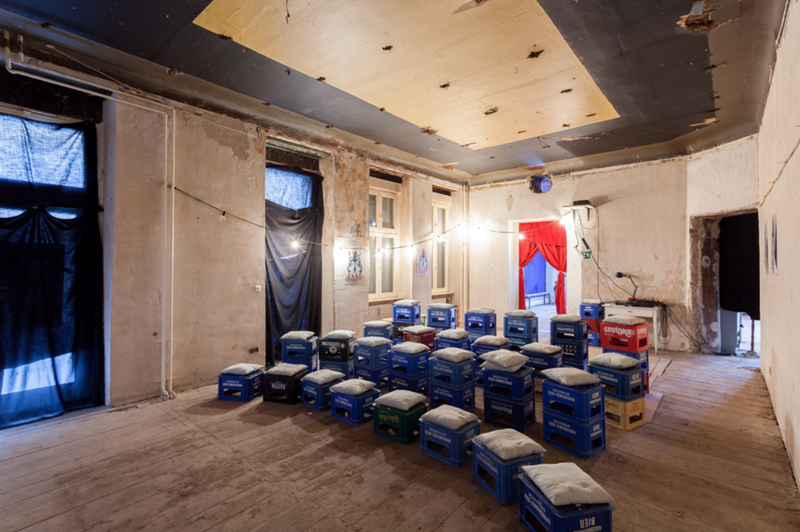 We were contacted early on in our building process by the Adria Filmtheater, a cinema in the west of Berlin, who told us that they were replacing their cinema chairs. We assembled a small team, rented a truck, and raced to pick up 100 seats that we were delighted to find were striking red, beautifully plush, and in impeccable condition. 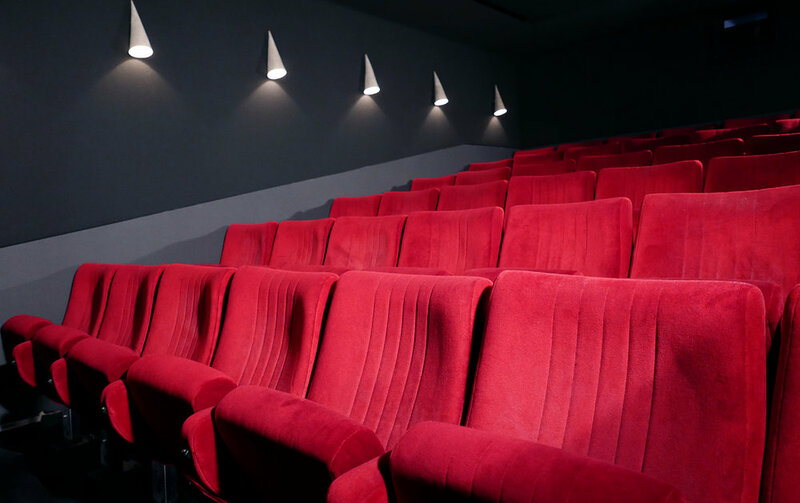 The Adria’s generosity was a huge step in helping us to complete the cinema and it was an incredible feeling to finally sit in them after they were installed in our screening-rooms. The only way to truly give an impression of the huge change the building has undergone over these last two years is through images. Below you can see some before and after photographs illustrating the enormous transformation that has happened with the help and support of our community of Wolves, to whom we will be continually grateful, and without which the dream of Wolf would not be happening. "Wolf is the perfect name [...]. Independent in spirit but powerful in numbers, von Stackelberg’s Wolf Gang is fighting the indie film fight." 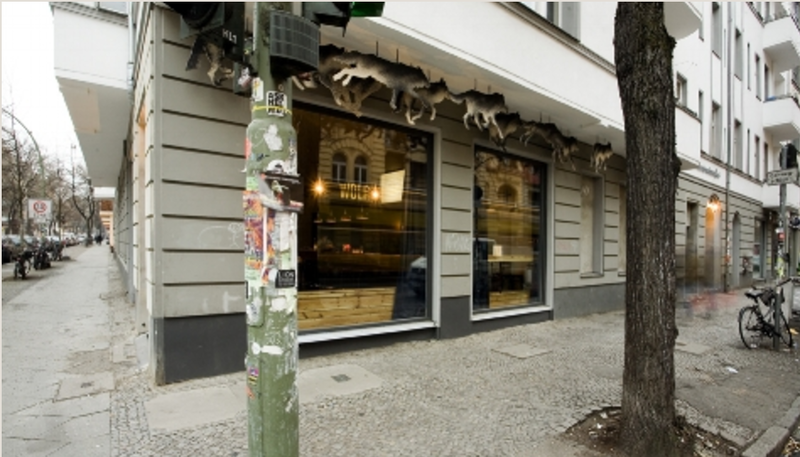 "Wolf Kino takes the concept of cinema as a communal experience and pushes it further. [..] They’re not just creating a fantastic place to watch films, but have created a unique space in which they are a part of the filmmaking process from start to finish. You can easily imagine a film coming to fruition here; from the initial idea forming over coffee in the café, developing through Studio 6, and then finally being screened in the cinema itself." Art Connect, BAF Berlin, Berlin Film Journal, Berliner Abendblatt, Berliner Morgenpost, Berliner Woche, Berliner Zeitung, Berliner Zeitung, Berliner Zeitung, Bild, BZ, Cee Cee, Delve Berlin, Exberliner, Exberliner, FAD Magazine, Filmmaker Magazine, Flux FM, Goethe Institut Blog, Himbeer Magazin, I Heart Berlin, Independent Cinema Office, Kino-Zeit, Kulturradio, Mit Vergnügen, Mit Vergnügen, Neuköllnernet, radio eins, radio eins, rbb, rbb, Screen Daily, Stil in Berlin, Tagesspiegel, Tagesspiegel, Tagesspiegel, taz, taz, Tess Magazine, Tip, Qiez.